"Sign The Petition To Demand Affordable EpiPen Prices!" EpiPens are a vital lifesaving tool for millions of Americans. 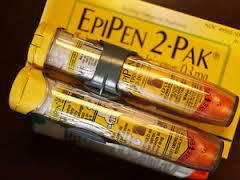 When they or their children experience violent allergic reactions, such as food allergies, a shot from an EpiPen can bring instant relief and avoid the possibility of sudden death. But Mylan Pharmaceuticals, the device’s manufacturer, has raised the price of the lifesaving pens by 500% since 2009. It now retails for $600 for a packet of two shots. Since the pens’ effectiveness expires in one year, families must keep buying them even if they seldom use them. Mylan’s revenues from specialty drugs have risen from $500 million to $1.5 billion since 2010, driven by its hikes in EpiPen prices. Mylan did not invent the drug but acquired the patent and has been milking out profits ever since. There is no effective competitor to EpiPens, Mylan having driven their potential opponents out of the market. So we must petition Congress and the FDA for relief from this unconscionable profit-taking at the expense of people who cannot afford to pay. With ObamaCare’s high deductibles, the cost of the shots becomes especially unsupportable. But a curious form of political pressure might work. Heather Bresch, the Mylan CEO -- who just had a pay raise to $19 million a year -- happens to be the daughter of West Virginia’s Democratic Senator Joe Manchin. As his colleagues, including Hillary, have blasted the EpiPen prices, he has had to join in their chorus of criticism. By focusing attention on Bresch, Manchin, and Mylan we might be able to bring about lower prices through voluntary corporate action or federal regulation. Please sign this petition demanding lower prices and please get as many of your friends and family as possible to sign! Your signature will count! We will send an email in your name to your Senators and Congressman and the FDA telling him or her of your position!